This comfortable condo benefits from a generous floor plan with enough space for all of life’s adventures. The open-concept kitchen is fully-equipped with new materials and features like a big kitchen island and a dining table for entertaining. You will love the sunny and welcoming living room ! 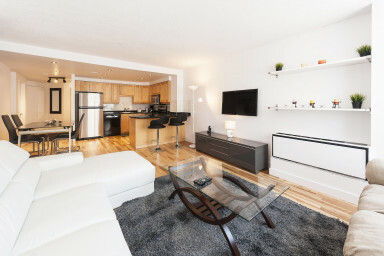 This fully-furnished condo is comprised of a large queen-sized bedroom with a patio with a view! To complete all of this, this apartment also offers a large closet space ideal for him or her! The renovated bathroom includes a bath and a shower as well as counter-mounted vanity. This apartment also benefits from a separate and closed laundry room for extra storage. A great address for families or extended stays! An older building, 1050 Amesbury Street is a traditional high-rise and is part of a development which includes a hotel and conference center. Guests have access to the swimming pool as well as a restaurant on the ground floor. Guests may also take advantage of a private parking space. With plenty of shops, cafés and pubs, Downtown means having access to a diverse range of restaurants, exclusive boutiques and plenty of entertainment to suit everyone’s needs. Serviced by the Guy-Concordia metro station, this area is host to a plethora of tasty restaurants like Kazu, free-trade coffee shops such as Café Myriade and plenty of bars like the Sir Winston Churchill and Hurley’s Irish pub. Up the street, the Forum Entertainment Complex offers movies, arcades and bowling lanes as well as the Alexis Nihon shopping mall. Don’t miss the Montreal Museum of Fine Arts, the lively Crescent Street or the Jardin de Sculpture for a cool look at the city. Montreal has never looked so good! Parking available starting at 150,00 CAD$ +Taxes per Month.